Climate change creates risk and volatility for your business. ClimBiz helps you assess, mitigate, and be resilient. ClimBiz provides a Software-as-a-Service tool presenting science-based climate change scenarios to help identify climate change risks and the associated challenges to your business. It will help you consider how to enact changes to ensure your business or organization is resilient. ClimBiz also provides bespoke climate change consulting analyses carefully tailored to your information and assessment needs. ClimBiz has processed terabytes of climate change simulations from science centers around the world to provide a rich set of 21st century climate change scenarios. The information has been processed using Big Data techniques to enable easy to consume future projections, thus making climate risk assessment easier and allowing you to focus on the development of adaptation and mitigation climate change strategies. ClimBiz is a climate and data science driven company seeking to enable organizations with the critical information necessary to address the risks of climate change. We endeavor to bring innovation and scientific integrity to the management of climate change risk and opportunity. 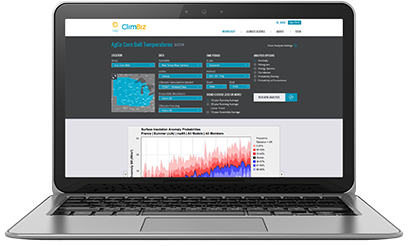 With support from the U.S. Department of Energy, ClimBiz provides customers with uniquely quantitative, reliable, and advantageous information about climate variability and its potential impacts.